iPad Mini 4 leather case – Interesting case for the iPad Mini is this Slim Fit Folio Leather Case Cover by SupCase. 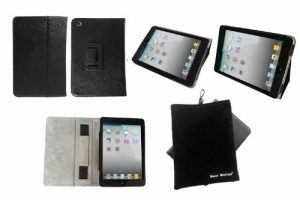 The case is made of premium synthetic leather, a lightweight and durable material, with an soft interior micro suede that provides protection for your iPad Minis screen. The front cover of the SupCase folio can be easily folded back for comfortable typing and video viewing positions. It has a built-in magnet that ensures a secure closure, and it also features a Smart Cover function, so it can automatically wake and put your device to sleep. The case received good reviews by the customer, who appreciated the overall quality of the case, the full accessibility of all the ports and buttons, the perfectly working sleep/wake feature, considering this case great for the money. See here iPad Mini 4 leather case available in several different colors. rooCASE Ultra-Slim Vegan Leather Folio Case for iPad Mini. Ultra-Slim profile (only 17mm with the iPad Mini inside the case) for this Vegan Leather Folio Case for iPad Mini by rooCASE. 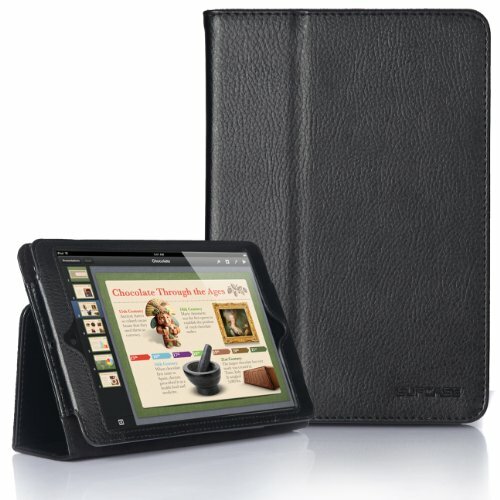 The case is made of Vegan Leather and the tablet slides in the case and secure with velcro flap. Also the front cover of this case transform into multi-angle landscape stand for 25 and 45 degree typing and viewing. The case also offer an elastic loop for stylus or pen. Bear Motion Genuine Leather Case for iPad Mini. This is a very sturdy and well made case, with an excellent leather fit and finish. The workmanship of the case is excellent, and the genuine leather has a nice feel and an elegant appearance. The auto sleep/wake function works perfectly with its strong magnets, allowing you to wake or put your iPad Mini to sleep by opening or closing the case. The Built in stand works perfectly and allows for multiple viewing angles. Bear Motion Genuine Leather Case for iPad Mini is available in Black, Brown, Purple and Red and is a great case offered at an excellent price. 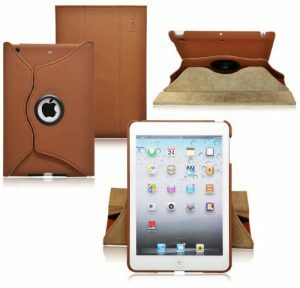 The Ionic Rotating Stand Leather Case for iPad Mini is a very interesting case that provide an attractive and functional way to carry and use your iPad Mini; its thin design makes it easy to carry inside of another case adding little weight or thickness. The form-fitted dual layer design of the Ionic case securely holds the device in place, protecting the tablet against scratches. The hard-sided exterior provides a sturdy and protective cover, while the soft interior lining adds color and protects the iPad Mini against scratches. This case features a unique, patent-pending mechanism that frames the Apple logo and allows the iPad Mini to rotate both vertically and horizontally while in the case. The case allows three viewing positions, including a lower angle which is ideal for typing on the screen. It also provides full access to all tablet functions so the device can be fully operational without leaving the case. The Ionic Rotating Stand Leather Case for iPad Mini is available in Brown, Blue, Red and Black. The Ionic Bluetooth Keyboard Tablet Stand Leather Case for iPad Mini is a very interesting product for any iPad Mini Owner. The main feature of this Ionic Case is the removeable semi rigid Mini keyboard that can be easily connected to the iPad Mini using bluetooth connectivity. According to some customers, the keyboard feels natural and it’s comfortable to use. There is also a sturdy stand on the back of the case to prevent the device from falling back when pressing on the screen. 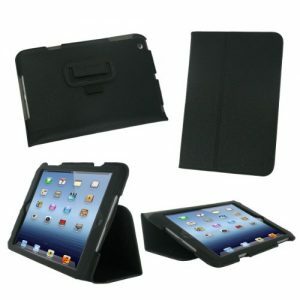 To keep the case closed are used clasp without a magnet, to not interfere with your tablet’s functions. 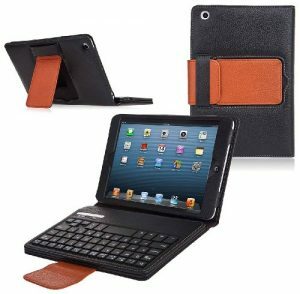 Available in black and brown color, the Ionic Bluetooth Keyboard Tablet Stand Leather Case for iPad Mini has a sturdy and stylish pebble-grain leather exterior.